Have you ever looked around your home and wondered what in the world to do? Or what in the world you should do first? I do this all the time in my home. I walk into any room, see a million projects that need to be started – or finished – and wonder where I should begin. Everywhere I look I find one more thing to add to my towering to-do list. Since I have the tendency to easily get distracted in my housework, coming up with some sort of a plan (and sticking to that plan!) is essential. 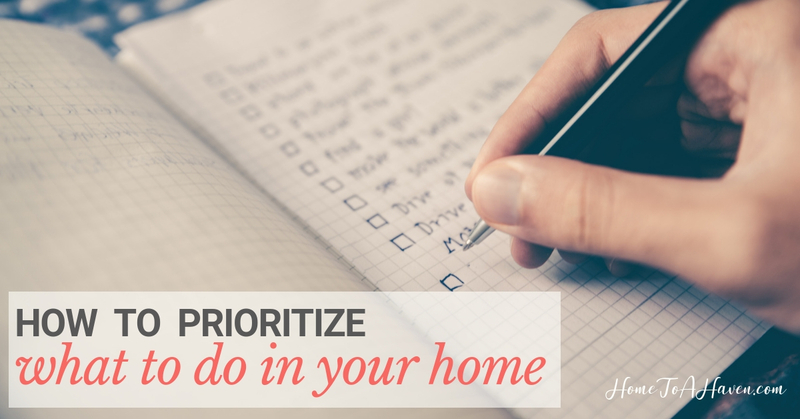 A great way to get things done in your home – or your life, in general – is to create a plan by prioritizing what needed to be done. 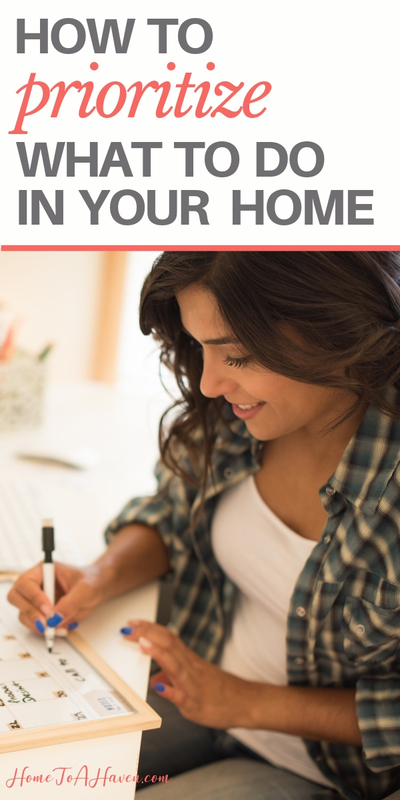 It can be hard enough to find time to try to stay on top of the basics in your home. But accomplishing more than what’s absolutely necessary? That can seem virtually impossible. 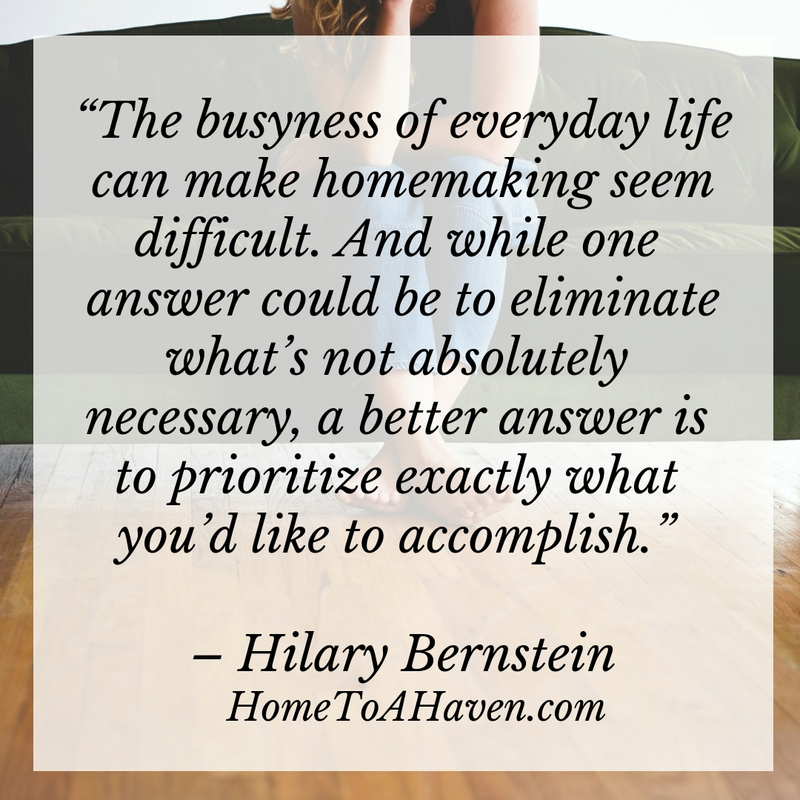 The busyness of everyday life can make homemaking seem difficult. And while one answer could be to eliminate what’s not absolutely necessary, a better answer is to prioritize exactly what you’d like to accomplish. First, you need to figure out exactly what needs done. To do this, go through each room and take notes about what you need to work on. If you’re planning long-term priorities, write down everything you notice. If all you see is mess and you need a fast fix, write down what’s completely needed. As you make your notes, begin to figure out what you’d like to finish first. In my own home, these first chores are the most glaring areas. Kitchen in a shambles? Work on that ASAP. Go through your list chore by chore, and think about what you could tackle right away, and what can be pushed off to a later day. Once you’ve figured out these chores and their priority, then set a date when you’ll work on them. Of course, these dates can be adjusted as time goes on. But try to set a date now and add it to your schedule. Unless you have days set aside for cleaning, try adding just one or two prioritized cleaning chores to each day. Keep working on non-negotiable daily chores, but add one more project to each day. It doesn’t have to be big. And you don’t have to dedicate a lot of time to it. Just make some sort of progress. Now that you know what you need to do – and when you’d like to do it – the hard work begins. You actually have to get to work. Start trying your lists and get cleaning. If something doesn’t seem to work well, try something else – but keep trying. Keep at it. Know that not everything may work out like you initially thought. But keep working and take notice of your results. You may just get a little housework done every day, but the important thing is to remember that you are getting it done. Work at your prioritized list. And slowly – but surely – get things finished. Once you finish the tasks that are a high priority, work on something else. Just stay persistent. Keep working at your list when you have time and energy, and you’ll eventually notice a big difference. You can finish your priorities in order, knowing that you’ve tackled the important things first and finally have time to catch up with the unimportant. Before you know it, you’ll look around your home and see a bunch of completed cleaning projects and put-together rooms. Not a towering to-do list. How do you prioritize what to do in your home?